Canna lilies (Canna x generalis) are large, ornamental flowers. Native to Africa, these tropical plants thrive in warm temperatures but are not frost-tolerant. In the winter, their tubers need to be dug up and stored until the ground warms up in the spring. Desirable for their tall, showy flowers and foliage, these plants have another talent besides looking pretty: They can filter water. Canna lilies have thick masses of roots that work as a filter. The roots also provide a home for beneficial organisms. As water forces its way past the roots, the organisms living there break down harmful pollutants. 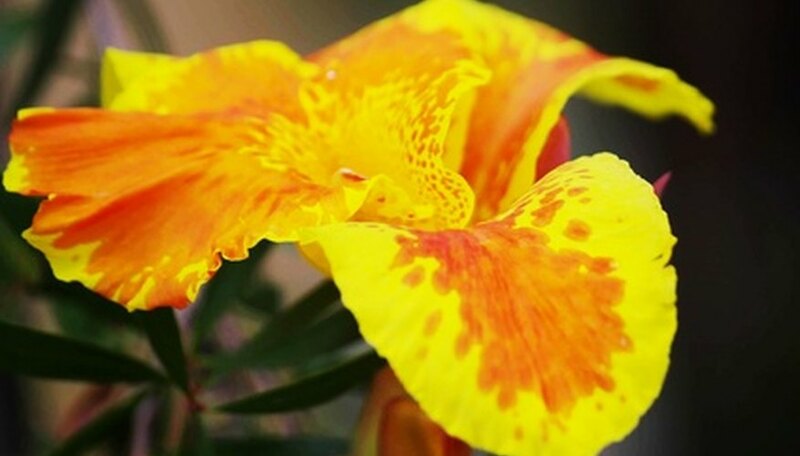 The excretions produced by the organisms, which are healthy for the plant, are then absorbed by the plant's roots, helping the canna to grow and thrive. Cannas remove toxic heavy metals, nitrogen, phosphorous and radioactive nuclides, among other pollutants. Fill a drainage ditch with canna lilies to clean storm runoff, or in areas where flooding occurs on a regular basis. White cannas are particularly at home in boggy areas, according to the University of Minnesota Extension. Or, use them to filter water from a septic tank. The use of canna lilies as a plant filter is not only a beautiful solution, but a cost-effective one. These inexpensive plants will bloom year after year with proper care and are a much less expensive way to clean water than man-made options. The plants have other health benefits as well. The large, broad leaves release both oxygen and water (through the process of transpiration) into the air, creating a healthier environment. It isn't just homeowners who can benefit from the canna's filtration properties. Large corporations also use ornamentalal plants -- including canna lilies -- along with marsh plants to filter waste water. For example, a nursery in California uses these plants to remove fertilizers and pesticides from their water runoff. The plants act as a barrier between the water from the nursery and the natural waterways that eventually drain to Newport Bay. By the time the nursery's water reaches the natural waterways, it has been filtered through the canna lilies and is free of chemicals and pollutants. Other plants work just as well as cannas to filter water. Wetland plants such as reeds and cattails absorb toxic pollutants and excess fertilizers, including nitrogen and phosphorous. Elephant ears and pennyworts, like canna lilies, are other water-loving ornamental plants that also remove pollutants.